1. 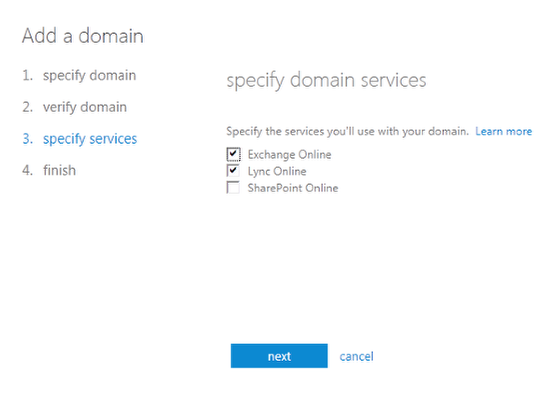 Login to the Office 365 Portal, then click domains on the left Quick Launch toolbar. 2. Click Add a domain. 3. 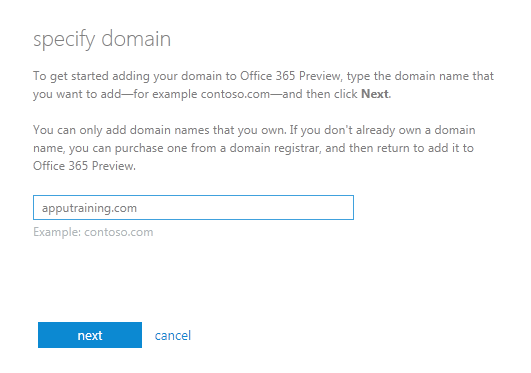 Enter the custom domain in the text box and click next. 4. Obtain the TXT or MX Verification Record. Click the See instructions for performing this step with: drop-down box to select the DNS hosting provider, or just choose General Instructions to see what needs to added to the DNS. *Some DNS hosts do not allow the use TXT records; that is why an MX record is provided. *The Verification Records are used only for verification and will not affect the functionality of the current domain. 5. Once the TXT record (or MX record) has been added, return to the portal and click Verify. If successful, a dialog box will appear prompting the selection of services for use on the domain. 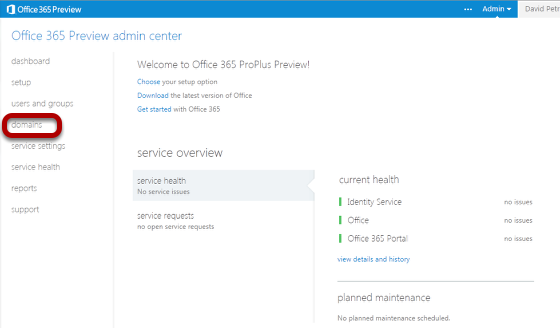 (Choose Exchange and Lync now; SharePoint will be configured later.) Click next after the services are chosen. 6. The last step is to configure the DNS. Once you click configure DNS records, a list of all the required DNS entries will be displayed. *Please stop and ensure the domain is set up with users/groups and the required information before making the final DNS changes. Do not change the MX records at this time unless mailboxes have been set up or the mail will bounce. The records can always be accessed or printed later to use if anything needs to be changed.